Development & Testing, Precision Components) at Winsert, Inc.
My company hired Wayne to host an on-site LinkedIn training program for myself, sales and marketing, engineering and human resources. In conjunction with Wayne's book and training, my team thought the entire program was extremely informative and successful. I can attest to the value of LinkedIn and overturning every rock along your way to social engineering. Winsert has increased our sales by ~15% by using LinkedIn. Thank you Wayne. John Kalter, Shareholder at Godfrey & Kahn, S.C.
Last week, Wayne conducted his LinkedIn basic training for my team at work. With his enthusiasm and deep knowledge of LinkedIn, Wayne taught the team tools and methods that we did not know and inspired those in the room to get active using LinkedIn. Wayne came prepared with an understanding of how much the members of my team were currently using LinkedIn and was conscious of the unique aspects of marketing in the legal profession. Simply put, Wayne is a great trainer! My company, Fidelity National Title Group, conducted a Sales Rally for 150 of our Sales Executives and Managers for our Midwest operations. 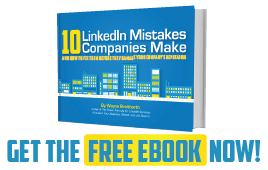 Wayne made us realize the power of LinkedIn and what it could do for our company not only in sales but recruiting. Wayne has an engaging and lively style that keeps your attention while he provides you with great information. Thanks Wayne! This past week we had Wayne spend a few hours with our Sales Team from around the world. Until then, I would describe our group as casual users of LinkedIn that weren't even scratching the surface of what was possible. The meeting was a huge hit! I now have an energized group that flew back to all corners of the world over the weekend and I'm seeing updates on profiles, new connections, groups being added, etc by the team because now they understand the power of the tool! Thanks Wayne! My company, QuadTech, invited Wayne to speak to our international sales team. In just a couple of hours, he opened our eyes to LinkedIn's unbelievable potential as a sales and marketing tool. Wayne is very entertaining and engaging, and you will be amazed at what you've been missing...especially if you're skeptical about social media. Wayne's presentation and book will change the way you do business. His book is the #1 bestselling book about LinkedIn in the world. There's good reason for that! Wayne came to InPro and introduced our company to the power of LinkedIn. His knowledge of LinkedIn is second to none, and he teaches you how to apply it to your business. I would recommend Wayne to any company looking to grow their business. I'm very pleased to recommend Wayne for LinkedIn training. His approach is practical and in my opinion high value. We recently completed a three-session program for my entire sales team via webinar and using Wayne's LinkedIn book. The results have been solid. In fact, we've had direct net new sales as a result of our focused use of LinkedIn as our digital media tool of choice. Wayne is an expert, and he delivers the training with a great sense of humor. Overall, great value. President and CEO, Burkart-Heisdorf Insurance Agency, Inc.
Wayne provided our organization with an awesome training experience. He brings not only an exceptional knowledge of LinkedIn, but presents the material as only one who has his boots on the ground and actually uses the tool can. Wayne has been instrumental in unlocking the power of social networking for our business. Rich Ryan, COO, Dorner Mfg. I’ve recently hosted the leaders of Dorner’s top distributors for our annual meeting. Wayne Breitbarth’s session on the use of LinkedIn to drive business results was the highlight of our event. Wayne’s ability to talk at a peer level to our group of owners/leaders provided invaluable insight for them.